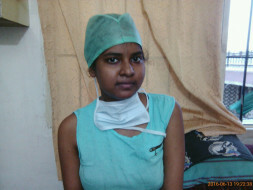 She is my sister saroj sharma suffering form lymphoma cancer from last 2 years,she is just 21 year old ,Doctor told that it is curable but the treatment is very costly and the cost is 25 lacs,they have a limited time to cure this disease.we are in the middle of the treatment ,we are getting good response but we don't have more money. we are planning to sell our house to save her life after this i also need your support .she is fighting from last 2 years ,she has dreams ,she want to smile,she want to enjoy the life,she want to see the world .she want your support to make her dreams true.please save my life. We'd like to inform that Saroj is fine now and has been discharged from the hospital. We'd like to thank you all for your support and prayers during this period. God bless, kindly post some updates too. All the best dear. Get well soon.